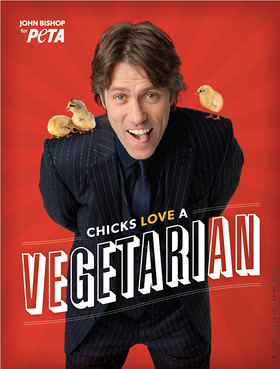 British comedian John Bishop is starring in a new ad for PETA with the tagline “Chicks Love A Vegetarian”. 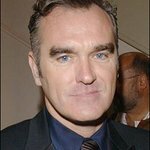 From PETA UK: "As a vegetarian, John wouldn’t dream of eating a chicken. After all, most chickens aren’t as lucky as the cute little friends perched on John’s shoulder. The lighted-hearted ad has a serious message. Not only are vegetarians less prone to diabetes, cancer, heart disease and obesity than meat-eaters are, they also evade some of the risk of impotence because the artery-clogging animal fat and cholesterol in meat can slow the flow of blood to all the body’s organs – not just the heart. And each vegetarian saves 100 animals a year from immense suffering on factory farms, in abattoirs, in nets or on the decks of fishing boats. To take the PETA pledge to go veg, click here.